... Will Never Be Defeated. This is the kind of stuff you learn when inspired by a piece of music. I'm on iTunes shuffle rotation, in a large playlist that's part of my library. The song, "¡El pueblo unido, jamás será vencido! ", performed by Inti Illimani w/ Manu Chao, came up and immediately caught my attention. We have two bumper stickers that we feel reflect the essence of our philosophy. I keep them on the portfolio that I take with me when I'm going to need to take notes on paper, which isn't so often any more. 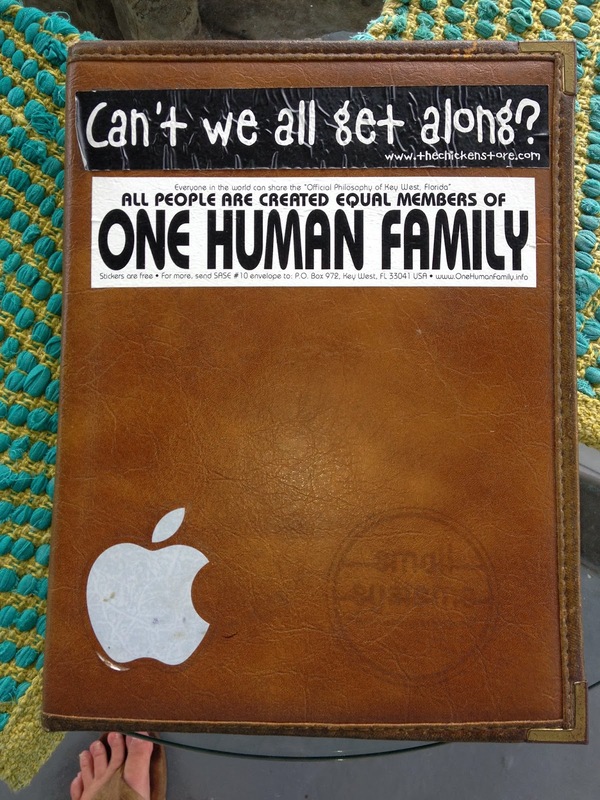 The first is the One Human Family sticker, which in its fullness reads: All People Are Created Equal Members of One Human Family. It's the Official Philosophy of Key West, Florida, adopted by resolution by the City Commission in October 2000. The other sticker reads Can't We All Get Along? The sentiment, of course, came from Rodney King of Los Angeles, who was brutally beaten by a gang of LAPD officers in 1991. The sticker was introduced at the Key West Chicken Store and was handed out or sold there. 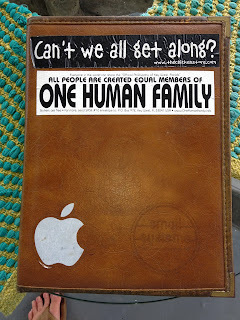 The Apple sticker, which we also have on our car, shows that we are an Apple Computer family with a preference for using Apple Computer products. Most of us do.